Today’s business leaders have hundreds of options when it comes to deploying technology to support business processes. This presents both an opportunity and a challenge. Implementing carefully selected tools and solutions can boost productivity and bring a host of other benefits. However, the sheer number of options available can make it difficult to sort out exactly which technologies will be effective and which would be a waste of time and money. To avoid going down a dead end, it is important to know exactly how a given technology will impact the process it is designed to support and to understand how it will lead to a positive return on the investment. 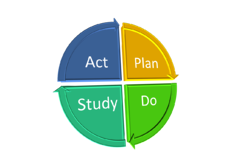 Today, we’re going to take a look at PDSA (Plan, Do, Study, Act) software and how it can play a role in an organization’s continuous improvement initiatives. To oversimplify, PDSA software helps support each aspect of the improvement cycle. Plan – A PDSA software solution provides a unified platform for gathering opportunities for improvement from staff on whatever device they prefer. It then routes those ideas to the appropriate manager who can begin to investigate and work on them or direct others to do so. This allows leaders to cast a very wide net when looking for improvement possibilities and makes it easy for the team to collaborate during the planning phase. Do – Once a plan of action is developed for a particular opportunity, PDSA software provides the workflow capabilities to make sure the plan is implemented and that timely progress is made. Tasks and due dates are assigned and everyone receives notifications of required actions. Mangers have visibility into all activities and are alerted if assignments are missed or overdue. Study – PDSA software includes the metrics and measurements necessary to track the success of each completed opportunity for improvement. In addition, it provides insight into the collective impact of all improvements across the organization. Leaders can look at how individuals, teams, departments, and the company as a whole measure up against improvement objectives. Act – The best PDSA solutions come with improvement broadcasting capabilities that make it possible to share improvement success across the entire organization. It serves as a repository of tribal knowledge making it easy to build on the successes, or avoid the pitfalls of past improvement activities. The powerful analytic capabilities of the KaiNexus solution have given us the ability to study the impact of the software supported continuous improvement efforts of our customers. Looking across thousands of opportunities for improvement, here’s what we found. Reduced cost - 13% of the improvement ideas resulted in cost savings. Of those, 80% are reductions in annual recurring expenses. The average cost saving idea saved just over $31,000 in the first year alone. Efficiency – Many opportunities are focused on saving time. On average, a time saving improvement saved 270 hours in the first year. “Soft Savings” – Of course, each improvement can impact more than one area. In addition to reduced costs and increased efficiency, improvements also impacted quality (54%), safety (15%) and staff and/or customer satisfaction (54%). In short, the evidence shows that there is a substantial ROI when PSDA software is used to bolster a continuous improvement mindset. Of course, it isn’t a magic bullet. Leaders must foster a culture that values improvement, cross functional collaboration and accountability to really reap the rewards, but providing the backbone to manage and measure improvement sets the stage for lasting and positive change.